Manfred Gerstenfeld, Chairman of the Jerusalem Center of Public Affairs was commenting on the “latent anti-Semitic feelings in Norwegian society” released by Operation Cast Lead. This shows that Zionists claim carte blanche when it comes to ethnic generalizations about others but cry “anti-Semitism” to silence criticism of themselves. The rabbi said he had been “very scared during the war. Hatred spread in a fast, dangerous way. This was blind emotionalism against Israel and against Jews. It gets deep at the heart of Norway’s emotional anti-Semitism. The current wave of anti-Semitism shows what people have been holding inside them,” he said. According to Gerstenfeld, “because Norway is a very tiny country with a language most don’t understand, nobody gives them much attention. Their anti-Semitism flew completely under the radar for a long time.” Now that the world is becoming aware of the situation in Norway, “the Norwegian elite won’t get away with this incredible arrogance any longer,” he asserted. This article illustrates two disturbing characteristics found in the Zionist (and perhaps Jewish) psyche which may be a form of mind control. 1) Zionists never say sorry because they are never wrong. They have suspended the law of cause and effect. Criticism, opposition or anti-Semitism is never the result of their own actions or behavior. It is always due to an irrational inbred hatred or prejudice on the part of others. Anti-Semitism gives them infallibility and immunity. But as long as Jews support Israel, they will be held responsible for Israel’s actions. 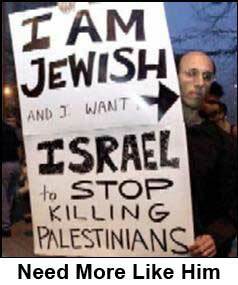 Zionism is all about creating anti-Semitism to force Jews to back their aggressive hidden agenda. (See my “The Zionist Protection Racket”) Jews are being used to build the Rothschild’s Thousand Year Kingdom, and when they are no longer needed by the Illuminati, they will be tossed aside. Zionists demonize and treat their opponents like subhumans and “haters” because they won’t admit their wrongdoing. This idea is bred into them so their leadership literally can get away with murder. Thus while some righteous Israeli soldiers reported numerous war crimes in Gaza, the IDF blithely concluded that these reports were “hearsay.” This trimming of the truth to fit the agenda has become commonplace in the world today. 2) Gerstenfeld’s threat that “the world is becoming aware of the situation in Norway” and the Norwegian elite “won’t get away with it any longer” reveals an authoritarian tendency. Zionists, like Communists, do not respond to criticism with rebuttals because they know they’re wrong. After marginalizing critics, they respond with ad hominem attacks, ridicule, smears, threats, legal actions, and attacks on their livelihood. Disingenuously, they cry “hatred” when in fact they are a major source of hatred in the world today. They are a big part of the dynamic of the emerging totalitarian world government. In the West (the US, Canada, Australia, the UK, Germany and France) this totalitarian system is synonymous with support for Zionism. Criticism of Israel is being banned. In the UK, a diplomat faces jail for expressing disgust at Israeli atrocities. British MP George Galloway is refused entry to Canada because of his support for Palestinians. Canadians were never given an opportunity to debate this “security agreement” whereby critics of Israel, a country built on terrorism, are suddenly accused of supporting terrorism. The way Zionists and Communists work, the way the New World Order works, is to control people by controlling thought and discourse. Read “The Protocols of the Elders of Zion” over and over. Don’t overlook the blueprint of the New World Order. Organized Jewry has noted an increase in anti-Semitism. This is due to two factors: Israel’s reaction to Lebanon in 2006 and Gaza in 2008: wildly disproportionate to the provocation, unequal in strength, and savagely targeting civilians. And more important, the perception that “Jews” are behind the current credit crisis. Indeed the Illuminati Jewish dominated Federal Reserve is responsible, according to G.H.W. Bush Assistant Secretary of Housing. Catherine Austin Fitts. All patriots must speak up and oppose the New World Order in many different ways. Let’s use our freedom or risk losing it. The book begins by detailing how then Assistant Secretary of Defense Perle and deputy Stephen D. Bryen were caught red-handed passing top-secret US documents to Israel. Yet despite the author’s best efforts and piles of evidence (the book includes pages of damning documentation in several appendices), the treason is successfully covered up by Zionist agents in US law enforcement and the media. “Incredible pressure was brought to bear upon the FBI and other sections at the Justice Department to terminate the investigation, and upon news media… to prevent publication of the details of the affair,” the author writes, providing a thorough account of the ensuing whitewash. Ultimately, the culprits — several of whom, notably, were proteges of then Senator Henry “Scoop” Jackson — not only escape punishment, but go on to occupy positions of enormous influence in subsequent US administrations (including the current one) where they continue to work diligently for Israel. The “network,” the author explains in no uncertain terms, is “working to achieve US policies that benefit Israel, but which are more and more damaging to America both at home and abroad.” Along with exposing blatant acts of espionage, Saba also chronicles how the network’s agents successfully fostered legislation over the years granting billions of US tax-payers’ dollars in annual military and financial “aid” to Israel. The extent of the network’s power in Washington, meanwhile, is well-known in most foreign, particularly Arab, capitals, says Saba.